THERE are at least a thousand Singaporean managers in hotels and restaurants in China and the Middle East, and the man- power-starved hospitality sector here is eyeing them hungrily. "Many of these workers have at least three years of experience overseas. They have useful skills and knowledge which they can share with junior staff," said Food and Beverage Managers' Association president Cheong Hai Poh. Convinced that getting these Singaporeans to return will lick the manpower problem here, he told reporters yesterday he hoped to get the support of employers taking part in a trade fair here next week. Called Food&HotelAsia2014, the fair is a four-day networking event for companies and workers in the food and hospitality industries, and expects to draw at least 60,000 visitors. Persuading employers is paramount as some have balked at hiring overseas Singaporeans whom they say are out of touch with local trends, said Mr Cheong. He related the experience of a Singaporean human resource director, who has worked five years in China, but was rejected when he applied for jobs in Singapore hotels for not having in-depth knowledge of the local industry. "When you are in a senior position, it is not as crucial for you to have in-depth knowledge about the country. Rather it is more important to have broad industry knowledge," added Mr Cheong. The F&B managers group plans to work with Contact Singapore, a government outfit focused on attracting skilled foreigners, to get in touch with Singaporeans abroad and link them up with interested employers. Singapore Hotel Association executive director Margaret Heng said the recruitment drive for overseas Singaporeans will build a pool of experienced middle managers in the food and beverage and hospitality sectors. "The turnover is too high. That is why many of the middle managers who are promoted may not have enough experience or the right skills to do the job," she said at the press conference held yesterday at the Devan Nair Institute for Employment and Employability in Jurong East. Industry figures show that the average monthly resignation rate in the food and beverage industry is 4.6 per cent, twice the average turnover of 2.3 per cent across the services sector. Employment and Employability Institute chief executive Gilbert Tan said his organisation will develop and run new training programmes to boost employee skills and retention rates in the hospitality sector. 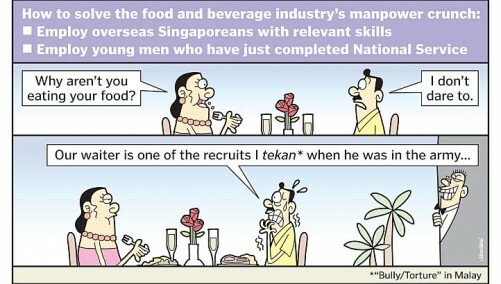 To tackle the manpower crunch, Mr Cheong said his association is looking at other ideas such as having a job fair to get young men to join restaurants and hotels after completing national service and getting small eateries to share a common pool of staff. "It is hard for workers to have career progression in a small restaurant, that is why many leave. "But if three or four eateries can come together, the staff can move around and pick up new skills. Maybe they will be encouraged to stay on," he said.